While some of us might be content with gaming for the sake of gaming, many of us want to play online blackjack for real money – not just the glory of winning. Blackjack is a good game to play for money if you’re confident in your strategy. Online blackjack for real money makes it very important that you know how to handle your cards in the big game – a mistake can mean an immediate loss and blackjack is a game of skill – not luck. 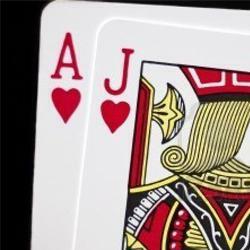 The most basic strategy of blackjack is to prevent the house from gaining the edge during play. Since there are countless possible combinations of cards during a round of play, it’s very important for players to know the rules of the game they are playing. Some forms of online blackjack for real money require you play against a dealer who must hold at seventeen. Other games let you play against other players who may have the option to hit at seventeen. The outcome of the two can be very different as should your strategy for winning a game regardless of how it is structured. Some general rules in a very oversimplified blackjack strategy are intended to tip the odds of the game in the favor of the player. In general, however, the house will almost always have an advantage in the long-term, but the better your skill, the better your odds of winning. – Always hit if your hand is less than 11. – Always stand if you have a hard hand of 17 to 21. – With a hard hand of 12 to 16, stand if the dealer is showing a 6 or lower. If the dealer is showing a 7 or higher, however, hit. – Never split fours, fives or tens. – Always split eights or aces.